We sell out every year ... reserve your fall pig early in the year! SkyLines happy healthy pastured pigs line up for ear scratches. SKYLINES PIGS LIVE THE GOOD LIFE . . . The vast majority of pigs raised in this country never get to see sunshine, green grass...or even feel the cool earth under their feet. Why? because they spend their entire lives in confinement animal feeding operations (CAFO's). These are huge buildings that house many hundreds (often thousands) of pigs, living in pens with concrete or slatted metal floors, under artificial lighting, in a completely controlled environment. They're fed a high-calorie grain-based diet that often consists of GMO corn and soy laced with antibiotics and other drugs to combat the diseases that occur in this unnatural environment. What kind of life is this? How can we support an industry that supports such values? How can we feed our families food that's been grown this way? SkyLines Farm has a different idea about how animals should live. Since 1992 we've been raising animals using time-tested organic and sustainable methods that respect both the animals and the land we share. 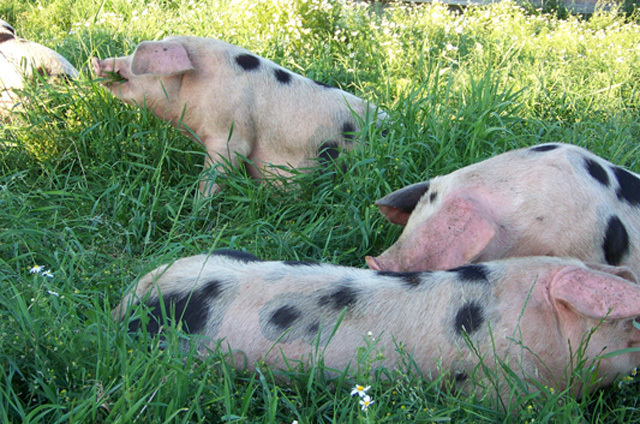 SkyLines pigs are in "hog heaven" on our lush green pastures. Our heritage breed pigs live in large outdoor spaces and thrive on the natural foods that used to make pigs such an indispensable part of a family farm. They absolutely love grazing and rooting in our green pastures, they adore the extra veggies from the organic garden and the extra eggs from the chickens, devour the farm's bounty of cherries, plums, apples & crabapples, and happily excavate and eat shrubs and small trees that I want cleared from the pastures. For extra protein and calories, the pigs also get a daily ration of locally-grown, non-GMO grains (barley and peas). This healthful varied diet, along with the fresh air and exercise the SkyLines pigs enjoy every day, produces a vibrantly happy healthy animal and also vastly superior meat. Compared to the typical white, mushy, tasteless grocery-store pork, SkyLines Farm pork has real-mmm-flavor and real texture! Are SkyLines Farm pigs certified organic? As with my beef (and lamb for 21 years), the quality of SkyLines Farm pigs is certified only by my long list of happy customers who come back year after year. The families who buy from me understand the true value of eating healthy, well-grown food, and they've also made a conscious choice to be part of the solution. Let's face it - America's corporate food system has problems. By purchasing from SkyLines Farm you're choosing to support sustainable agricultural practices and America's small farmers. And you're also supporting your local economy by keeping some of your food dollars right here! SkyLines pigs enjoy goodies from the organic vegetable garden all summer. When are SkyLines pigs available? In the fall of each year. Reservations with deposits are accepted all year, and reserved animals are processed and delivered September - November. We sell out every year. Most years, all of the years's animals are reserved months in advance, so please get your reservation in early to avoid disappointment. Sorry, shipping is not available. SkyLines pigs and beef are only sold locally. See the delivery locations listed below, under "Getting Your Order Home." Many of my customers enjoy making personal connections with the farmers who grow their food. They've come to SkyLines Farm to meet me and meet the animals, and seen for themselves how their food is raised. Visitors are always amazed and delighted to see how calm, relaxed, and clearly happy the SkyLines Farm animals are. (Everyone around here enjoys the good life, including the farmer, and it shows!) You too are encouraged to schedule a farm visit - write or call to set up your visit today. Here's how it works: You purchase a live pig from me, and as a free service to my customers I make the processing arrangements for you. If an entire pig is more meat than you need, purchase a half-pig and I will coordinate your order with other customers' orders so you can share the purchase of an entire animal. Like most small farmers I don't have a certified scale on my farm to weigh your live animal for you, so the common practice is to calculate your purchase price based on the processor's "hanging weight" of the animal. This is the weight of the useable portions of the slaughtered animal before cutting and wrapping. In addition, you pay the processing fee for custom cutting, wrapping, and freezing. + processing which averages about $175/half pig, $350/whole pig. Processing fees vary, based on how much of your pig your order as smoked and/or made into sausage. See specific prices in the cut list below. *Since you are purchasing an individual animal, actual price will depend on the actual weight. *Hanging weights generally range from 85-100 lbs/half pig, 170-220 lbs/whole pig. Feel free to specify if you'd prefer an animal in the smaller or larger range. *Processing cost includes harvesting & transporting the animal, cutting & wrapping, curing, slicing & sausage making if requested. A nonrefundable deposit is required to reserve an animal ($150/half-pig, $300/whole pig.) Make your payment with a personal check mailed to the farm or online via PayPal (use your PayPal account balance, or quickly & easily pay with a credit card through PayPal). Payment of the balance is due at delivery, once I know the exact weight of your animal. At delivery, you will also pay the processor's fee with a second check, once we know the exact weight of your animal. Please contact me to confirm availability before making payment for a reservation. Write me at melissa@skylinesfarm.com or call 208/875-8747. In early fall I will contact you to confirm your cutting instructions and to discuss a tentative date (September or November) & location for delivery. Every fall I arrange to have each of the SkyLines reserved pigs professionally and humanely slaughtered, either right here on the farm or at one of my two favorite local, family-owned, custom meat processors in the Moscow, ID area (C&L Locker or Potlatch Pack). Your pig is then carefully cut to your specifications, double-wrapped with plastic film and heavy-duty freezer paper, labeled with the type of cut and placed in a commercial freezer until it's ready to go into your own home freezer. After cutting, the cured meats you have ordered (bacon, ham, sausage) will be prepared to your specifications. Once the cured meats are ready, your entire order will be ready. When your order is nearly ready, I'll contact you to finalize arrangements for delivery. I'll be happy to personally deliver your order at no charge. Free delivery is currently available to Lewiston, Moscow-Pullman, Spokane, Coeur d'Alene, Sandpoint, Bonners Ferry, and points between. To conserve fuel I consolidate multiple deliveries in each area to a centralized meeting place. If you live in a community not listed here, contact me and we'll try to work out delivery arrangements. Sorry, SkyLines pigs are only sold locally. See the delivery locations listed above. AVAILABLE CUTS from half or whole pig. Choose the cuts you prefer. If you don't want a specific cut, that meat will be added to your sausage. - Chop Thickness: 3/4" - 1" - 1-1/2"
Half pig: Order up to two flavors of sausage and pick either bulk or links for each. Whole pig: Order up to four flavors of sausage and pick either bulk or links for each. Skin-On Link Sausage Flavors: Polish - Bratwurst - Jalapeno Cheddar Bratwurst (additional $.65/lb) - Italian (fresh only) - Chorizo (smoked only, additional $.65/lb). WHAT ARE FOLKS SAYING ABOUT SKYLINES LAMB, BEEF, & PORK? Our customers have been raving for over 25 years. Here's a sampling . . .
Hi Melissa, Dolan and I just wanted to drop you an email to say how wonderful the pig is. We had one of the hams last week and so very delicious. The pork chops are over the moon. We will want to order again for sure, maybe a whole one, we are using this half pretty quick because of the great quality. Thank you for caring so much about your meat quality. Just can't say enough. Thank you! "Hi Melissa, I've been meaning to write you for a few weeks now about how much we're enjoying our pork. Wow, so delicious! The fat on the ham is quite possibly the best tasting fat ever! Also, I'd never opened a package of raw and unseasoned ground pork and thought 'mmm, that smells good,' until my first package of plain ground pork from one of your pigs. Unsurpassed quality and taste. Thanks!" "We're looking forward to another wonderful year of delicious pork! Thank you for what you do, Melissa. It's wonderful to be able to set the example for our almost four-year-old daughter how important it is to buy humanely, responsibly raised meat. It's delicious and we feel good about supporting good, local farmers who care for these animals so well instead of the commercially raised meats and all the suffering and environmental damage that includes. We're so lucky to have you here locally. Be sure to keep us on your list for next year's purchase!" "Your pork is amazing! I had no idea it was possible that pork could taste like this. It's incredible. You have a lifelong customer. Do you only have pork available once a year? If you'll have more this year I'd like to buy it. Thank you!" "Best Pig Ever. Hi Melissa, just wanted to tell you that we are very happy with the pig we got from you. The meat is exceptional, the bacon the best ever and the processing is top notch." "Melissa, the beef is top notch. Nice flavor! Tonight was our first night without beef since we picked it up (9 days ago). Great job. Thank you." "Melissa, Just wanted to drop you a line and let you know how happy we've been with the beef! We've cooked some steaks by doing a quick sear in garlic butter in a skillet and then putting it in the oven at 250 for 25-30 minutes, and WOW. Perfection! It's even still a decent medium rare, and tender to boot! Thank you so much for your tips and the wonderful product." "We are very pleased with the pork we purchased from you! The ground pork is so clean and flavorful. The fat on the chops and steaks is beautiful. It looks so pristine I almost don't want to cook it. Almost. I made a stew with the country-style ribs, braising them in apple cider, cabbage, and mirepoix. Amazing! I also seasoned and roasted the spare ribs which came out fantastic. I've rendered some of the leaf lard. It is pure, snow white. What a joy to cook with. Thank you for providing us with such a high quality product!" "I'm coming back for more! Hi Melissa, I'd like to reserve another half a cow. It's the most delicious beef I've ever tasted. It's so tender, but has texture, and it doesn't have that gamey flavor some grass fed beef can get. It's rich and buttery, just the way quality beef should be. I'm so happy I got my meat from you!" "Best bacon ever! Thank you again for raising these animals for us (pork, beef, lamb)!" One Thanksgiving we had planned to serve one of Melissa's legs of lamb for a big dinner with friends. Well, more and more people kept getting invited so we pulled out all our lamb chops too. On the day of the dinner we still didn't think we'd have enough, so Jimmy went to the supermarket and bought some more lamb chops. When it was all over everything was gone ... except the store-bought lamb chops! Nobody wanted them, they were all greasy and fatty and awful looking compared to Melissa's. I'd never seen people leave lamb chops on the table before!" "Melissa - As always, thanks so much for all that you do. I feel SO fortunate to be able to have a humane, local source for virtually all of our meat (beef, lamb, pork). You have changed our diet for the better, and I take every chance I get to tell others about your operation and treatment of animals. And speaking of dogs, give your (livestock guardian) dogs a scratch for me." "This was my first year purchasing beef from you and I'm delighted with it! It's the best I've tasted in years. You will become my only choice for meat from now on. Thanks so much, Melissa, for the outstanding quality you have produced!" MORE SKYLINES CUSTOMERS RAVE ABOUT THE FLAVOR . . .
"You know I love your beef and lamb. Will you be doing pork again? You have ruined me as far as ever getting any meat from a grocery store again!" "We cannot believe the perfect flavor of your lamb!! We will go through what you brought in no time. Is there any chance we can get two to three more lambs?" "We have been enjoying all of the meat we purchased from you. The beef is far more tender than grassfed beef we have eaten in the past. I might need some more come fall. Also, I just took some lamb out of the freezer this morning and yikes, it's almost all gone. Can I reserve two lambs from you again? Thanks so much for doing such an outstanding job raising healthy, happy animals!" "We purchased one whole lamb from you in October. Just wanted to let you know, we absolutely LOVE our lamb. Tastes fantastic and knowing where it is from makes it ever better. We would love to be on your list for another lamb next year if possible. "Melissa - We had your lamb chops broiled last night for dinner. They were fantastic! We are wondering if we can get more lamb to carry us through the winter?" "Melissa...Had a "real" steak dinner last night. Your beef was fantastic. My whole family really enjoyed it. It was nice to meet you in person and hope to try lamb next year. Thanks again!" "Melissa, we had lamb meat loaf tonight - mmm! Tell your customers this: For the best gourmet lamb you could ever provide your family, I think you should buy SkyLines Farm lamb. Melissa's animals are treated humanely and raised carefully, you are buying locally, the meat is processed locally...and your stomach will thank you! Never tried lamb? Expand your horizons from feedlot beef and chicken and farmed fish. You won't be disapointed." "Hi Melissa, Just a quick note to let you know that, as in previous years, this year's lamb is great!" READ ON TO LEARN HOW THE SKYLINES FARM ANIMALS HAVE BEEN RAISED SINCE 1992 . . . When you serve SkyLines Farm lamb, beef, & pork you can feel great about it, knowing that animal was raised the way Mother Nature intended . . . nourished entirely by mom's rich milk, our own lush green summer pastures, and free-choice salt, kelp, and trace minerals. Absolutely nothing else. Unlike much of the livestock raised today, our lambs and beef are never pushed to grow faster with fattening grains or supplements that sometimes even include animal by-products. Instead, they grow at their own natural pace, eating only the simple, fresh foods on which ruminant animals were designed to thrive...well-managed lush green pasture grasses and hays. In addition to avoiding drugs and chemicals, our organic approach includes regularly scheduled doses of the miracle herb garlic, plus management practices that promote health like making sure pasture stocking rates are low enough to provide plenty of room for all of the animals, lots of fresh air and regular exercise, intensive rotational grazing techniques, and much more. This philosophy for managing the animals and the farm itself has kept all the SkyLines animals in superb health for many years, without having to rely on the drug and chemical "quick fixes" that so many consider to be essential. Visit the Management Practices pages to learn about all of our management methods and see how successful they've been over the years. There you'll also find details and photos of the team of Great Pyrenees guard dogs who provide the ultimate in predator-friendly protection for the farm. More and more research is demonstrating that eating meat from grassfed animals is better for our own health, better for the animals we raise, and better for the environment too. But raising quality grassfed animals requires more than simply allowing the animals free access to grass. Good management of that grass is critical. Two major components of grass management are actively managing the fertility and tilth of the soil and controlling the animals' access to the pastures so the grasses can rest, regrow, and process the nutrients the animals have deposited. SkyLines Farm's intensive rotational grazing system allows us to effectively manage the farm's grass while also fulfilling each animal's very natural desire to graze on the freshest feed possible. A network of many subdivided pastures with strategically placed gates and runways allow us to easily and frequently move the animals from pasture to pasture across the farm as they harvest the grasses. Once the animals are moved from a pasture after grazing, the grasses can rest and regrow undisturbed for many weeks (plus all winter), and the soil can absorb and break down the natural fertilizer the animals left behind. Over the spring-to-fall grazing season, the SkyLines animals slowly makes two or three trips through the farm's pastures, so they are always dining on actively growing, highly nutritious, "salad bar fresh" greens. Thanks in part to this natural diet and lifestyle (and possibly the periodic doses of garlic), friends and customers frequently comment on SkyLines lamb, beef, and pork's just-right leanness and fantastic flavor. And they tell us just how much they like it by coming back for more, year after year. Want to learn more about the many benefits of grassfed meat - to our own health, to the well-being of our animals, and to the environment? If you're interested in additional scientific and anecdotal information about the benefits of raising ruminant animals on grass alone, you could start with Jo Robinson's books, "Why Grassfed is Best!" and "Pasture Perfect," and also visit her extensive website www.eatwild.com. Jo Robinson that you might find interesting . . .